Riot control methods: What's in your riot's menu? How to deal with them? - Çağrı Mert Bakırcı part 4.
the development of the effects of gases. In addition to tear gas varieties discussed in the previous part [LINK LINK LINK] of this article, there are much more dangerous chemical weapons used throughout history. 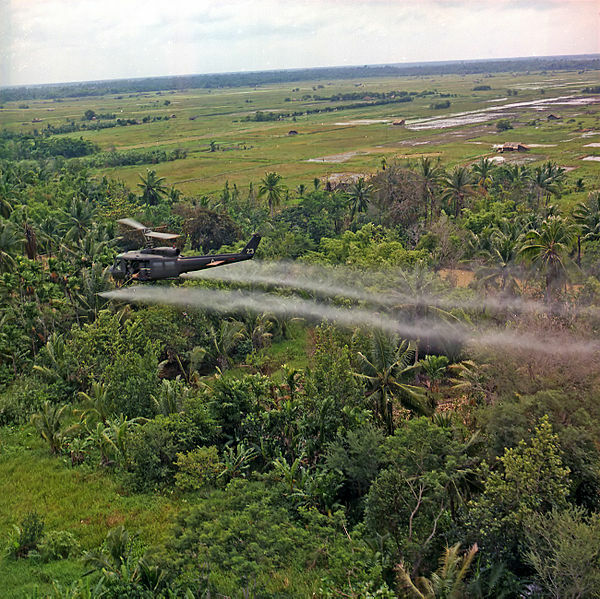 First, we will study the Rainbow Herbicides used by the US military in Southeast Asia during the Vietnam War. The 8 varieties, each produced for a different purpose, are strictly forbidden internationally. The objective in their utilization was destroying the plant-based ecosystem of an agricultural food production and/or destroying foliage which provides the enemy cover. 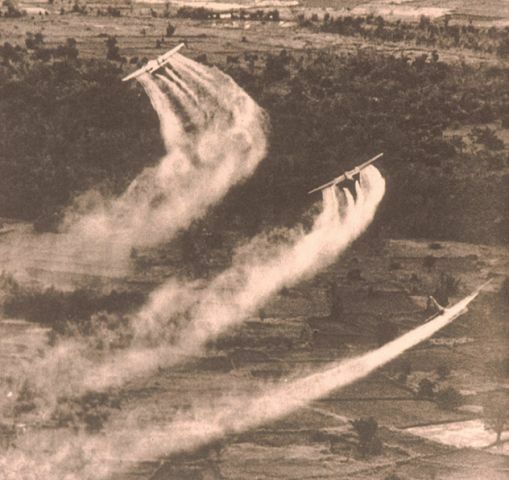 Agent Pink and Agent Green contain large amounts of TCDD and were only used in the early “testing” stages of the spraying program before 1964. Agent Purple, designed to clear brush, was also used in the same period. Agent Blue, aimed at killing narrow leaf plants (such as rice, grass, banana and bamboo), and Agent White were used extensively (around 75 and 20 million liters, respectively) in Vietnam and are still used in industrial agriculture complexes. 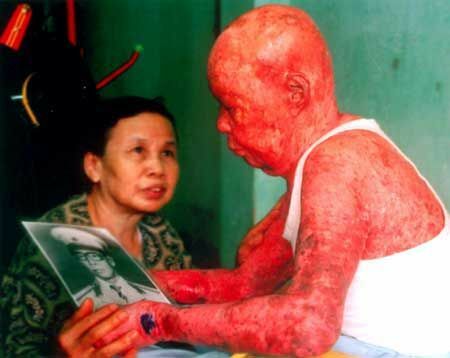 Below are some photos of how the Agent Orange was sprayed. Note that the names of these chemicals indicate the color of stripes on their containers and not the color of the gas sprayed. The Rainbow Herbicides, Agent Orange especially, are highly toxic. Their health effects include throat cancer, acute/chronic leukemia, Hodgkin's lymphoma, lung cancer, prostate cancer, soft tissue sarcoma, colon cancer, as well as nerve, digestive, skin and respiratory disorders. In many countries, not only their usage but also to keep them is strictly forbidden. Agent Orange is not designed for riot control and is therefore not used via capsules as the OC, CS, CR and CN, the tear gas varieties used by the police as we mentioned in the previous part. They are sprayed by aircrafts, as seen in the photos above. 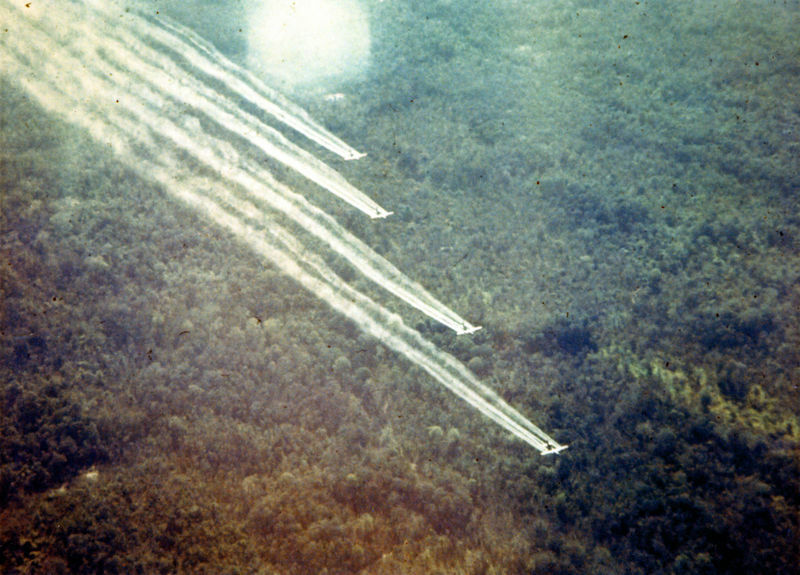 No canisters or capsules for Agent Orange were observed until now anywhere in the world. Agent Orange contains high amounts of dioxin and specifically TCDD, one of the most dangerous chemical weapons. Once again, it is not and cannot be used for riot control. Phosgene and Diphosgene: They were used in World War I and in the 2nd Sino-Japanese War. Known to be lethal, their use is strongly restricted by law. Mustard gas (Sulfur mustard): According to the Wikipedia article on Sulfur mustard, they have “the ability to form large blisters on the exposed skin and in the lungs. Pure sulfur mustards are colorless, viscous liquids at room temperature. When used in impure form, such as warfare agents, they are usually yellow-brown in color and have an odor resembling mustard plants, garlic, or horseradish, hence the name.” It affects the guanine in the DNA, prevents cellular division and leads to programmed cell death. 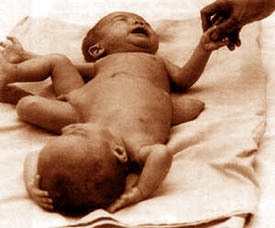 Its use is regulated under the 1993 Chemical Weapons Convention. Nerve agents: They are a class of phosphorus- containing organic chemicals that are known to be lethal. United Nations considers them as weapons of mass destruction, and they are therefore not used in riot control. One of the frequently asked questions was whether there are problems due to exposure to gases whose expiry dates passed. Unfortunately, it is not known whether expired gases have additional health hazards or not. This uncertainty itself is sufficient reason for not using expired gases. Although future research may as well show that it is biologically or chemically irrelevant, assuming this probability can be dangerous and police forces should not make such risky presuppositions. It was observed (in India, Cairo, Jordan and Greece) that gases which are expired by more than 30 years were used by police forces. Interviewed experts on the subject matter stated (for instance in Al-Masry Al-Youm newspaper) that long exposure to expired gases may harm more severely than normal gases. However, this information does not seem to rely on research, and a more established opinion on the subject cannot be reached until further studies. While some claim that expired gases have less effects (and that therefore they should be used before the expiry date to obtain full effectiveness), others argue that long waited gases may become more harmful and cause uncontrolled effects. According to some doctors, long waited gases may lead to unexpected side effects. One can say that the chemicals used in tear gas are unstable compounds and they dissolve after some time. The resulting chemicals may be harmful to body, or maybe harmless. Still, a direct consequence is that the tearing effect is reduced in this way. In short, further research is needed to reach a solid conclusion on this subject. Why Do We Feel That The Effects Are Increasing/Changing? 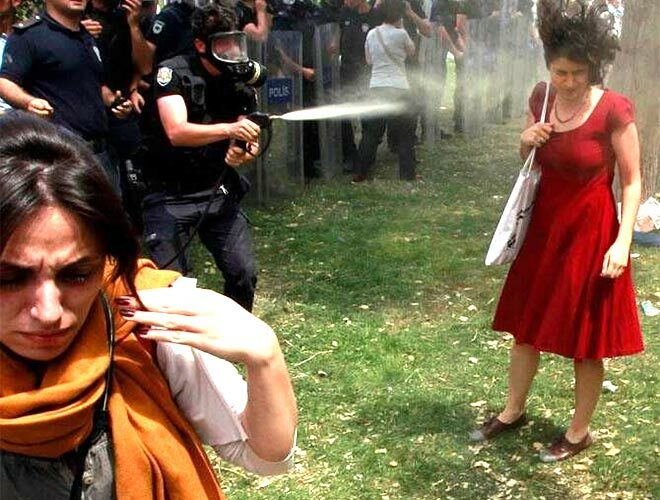 During the uprising in Turkey, many protesters experienced that the effects of the chemicals changed and increased. This phenomenon was observed in many other riots that had long durations. As a result, several speculations follow and various wrong news items spread, claiming the use of chemicals that may not be used (nor kept) or that are not produced anymore. We should know that the chemicals used against the protests have not changed. For instance, during the Gezi resistance, the chemicals used were always OC, CS and perhaps CR (although we did not find any evidence of its use yet). [See Part 3 of this article.] These are non-lethal chemical weapons routinely used in various countries. There are two main reasons for the protesters to feel an increase in the effects. First, extensive and long-duration use of chemicals have a cumulative effect and thus cause different reaction in the body. As this is not felt by a single individual but by a large group of people at the same time, the protesters may conclude that a different type of gas is used. However, what changes is not the gas but the effects of the same gas (OC, CS or CR). In other words, repetitive exposure to the same chemical may cause different physical reactions. The reason for many people to feel the change simultaneously is as follows: The thresholds for the receptors and nerves affected by these chemicals are at similar levels for all human beings. Therefore, after a certain dose, there is a simultaneous reaction to the gases in many individuals, such as pain and inflammation. All this applies to the gas bombs shot in canisters (as their content is fixed and cannot be changed after the production). The second reason, on the other hand, relates to water cannons and the chemicals mixed with water sprayed from them. Contrary to common belief, the liquid sprayed by a water cannon is not pure water. As mentioned before, micro-particles can be added to increase friction, and tear gas can be added too. When the amount of tear gas compounds is increased in the mixture, its effect on the body increases. Moreover, as opposed to being exposed to gas, these mixtures directly affect the skin and therefore have a stronger effect. (Furthermore, the CR gas – if used – is much more effective in wet parts.) So, when the security forces increase the amount of chemicals in the mixture, their effects increase and the physical reaction of the protester's body may change. To sum up, an increase in pain due to chemicals does not necessarily imply a change in the chemicals. Increased use of the same chemical would give the same result. While the gases in chemicals cannot be altered (they are bought as they are), the chemical concentrations in the water cannons may vary. The police forces should take special care about this as chemically dense mixtures may cause permanent damages and even death. There is a particularly important issue on this subject: Contrary to the gases bought in canisters, the chemicals used in the water cannons are hard to identify. Hence, it is crucial to analyze the liquid mixtures in order to understand their actual content. To this end, you can keep your clothes that are exposed to them and let them analyzed in labs with a lawyer's help. However, it is also useful to avoid misinformation on this subject. It is wrong and misleading to claim (without evidence) that the police used unknown gases and chemicals, just to prove the legitimacy of the protests. The “normal” gases already classify as chemical weapons and their exaggerated use in the Gezi protests is already horrifying for any sane person who could imagine its consequences. Therefore, what is needed is to emphasize the already existing error and crime, instead of speculating and producing unverified information. In any case, the use of tear gases in riot control is very dangerous for public health and should be stopped immediately. Editorial note: The original article suggests the followings: Avoid contact. Be prepared. Remain outdoors. 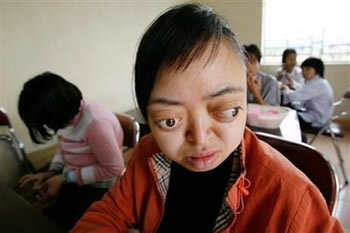 Blink your eyes and wash them with water. Take off your clothes. Use cold water and neutralizing chemicals. Use soap and water after some time. Get medical help. Help the animals around you. While there is no effective way of getting rid of these gases and chemicals, the most convenient way would be the prohibition and restriction of their uses. These chemicals can be lethal, especially when their dose is increased. While their effects can be reduced by using other neutralizing chemicals, the individuals exposed to them would experience middle-term and long-term effects of them. Therefore, the protesters are advised to get medical support as soon as they can, when they are exposed to these gases. It should be kept in mind that the 1925 Geneva Protocol bans the use of lethal biological and chemical weapons and Turkey signed this protocol. Hence, governments around world should act responsibly when using chemicals in riot control. Otherwise, they would be acceding that they aim at murdering their own people. Follow-up: It is now documented that the police used chemicals in Adana during the uprising. 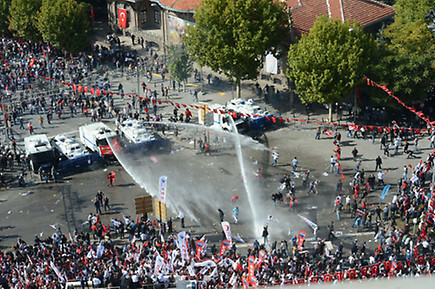 Chemical analysis showed that the water mixture used by the water cannons contained dihydrocapsaicin, which is known to have lethal effects.